Our top-of-the-line Tow-Behind, the PRO MAX52T, cuts 52" wide. Its powerful 22 HP V-Twin engine lets you mow up to 2.4 acres per hour and reclaim overgrown property in record time. Take down the thickest growth and make cutting height adjustments on the fly by remote control! The DR PRO MAX52T is the biggest and most powerful Tow-Behind Field and Brush Mower we have ever offered. With a 22HP V-Twin engine and 52" cutting width, this juggernaut will take down the toughest growth you can throw at it and do it fast–covering up to 2.4 acres per hour. Towed with your ATV or UTV, this is the truly easy way to reclaim your property—in ride-on comfort. The PRO MAX cuts from 4" to 7.5" high and you can adjust mowing height on the fly with the electric lift feature. A rocker switch (mounted on the same remote control as the blade engagement switch) makes it easy to change on the go. Make easy adjustments to the cutting height (from 4" to 7.5") from your tow vehicle. A battery powered actuator does the work, allowing you to change mowing heights on the fly, without stopping. The cabled remote control can be routed to your tow vehicle, and it handles two different functions: 1) engaging the blade and 2) raising or lowering the cutting height. Similar to the debris shields used on commercial roadside mowers, this guard stops material from flying forward. The 52” mowing deck is enclosed on 3 sides, so cut material is chopped and re-chopped, leaving no windrows behind. The 2-piece tow bar allows for offsetting the mowing deck to the left or right…or you can mow right behind your tow vehicle. Mow up to 2.4 acres per hour! Mowing times will vary with conditions (density of growth and features of terrain), but hooked up to your ATV the PRO MAX52T Brush Mower can clear as much 2.4 acres per hour—while you ride in comfort! Cutting Height 4" to 7-1/2"
I’ve only used this machine for about 5 hours in my pasture and so far this thing works like a champ. I have 20 acres left and I’m looking forward to mowing it. So will see how it goes. I own a remote ranch, completely off the grid, and I am not that handy but learning quickly. I needed a serious brush mower and went with the Pro Model. I could not be more pleased. I hooked the beast up to my ATV and headed out mowing for five straight hours. Gas efficiency good. Trails had three feet of growth and my pastures - in places - had seven foot 1-2 diameter saplings and weeds. Turned everything into salad. Popped a belt but I can repair after a little Youtube brush up. Highly recommend this product. Works great and I foresee many years of use ahead. I've been looking at the DR tow behind mowers for some time now. They ran a great price reduction and free shipping offer and I felt it was the right time to get it. Setup was easy and the manual was well written and easy to follow. Positives: It is robust and does a great job of cutting overgrown grasses and small bushes and trees. Negatives: The control cable for the remote is too short for a UTV like my Kubota. A bungee cord worked well though in keeping the controller in the bed of the UTV. Second Negative. The battery fell out of the bracket and I was lucky to find it. I would recommend that the battery bracket be redesigned to include a wrap around strap to prevent this from reoccurring. A large zip-tie around the battery and it's hold down strap is my work-around. I'll be trying it out next year. All in all: A very good machine, well designed and a pleasure to work with. This this is a beast! It will literally eat anything you can get under it! The service side is great as well, I had an issue with the remote cable My fault not theirs no questions asked they are sending me a new one. I didn't want to buy a tractor and hoped this would help that and it did! Works better than advertised! This Thing is a beast of a mower. This mowed over anything I put under it. The only thing I didn’t like is that the picture shows a tow hitch with it and it didn’t come with one and when I emailed about it, I was told it was an extra charge. It should have came with one when you are spending that much money. Response from DR SupportHi Joe, thank you so much for taking the time to write this review. We're happy to hear you're enjoying the Tow-Behind Field and Brush Mower. We apologize that you were given incorrect information. This unit should have come with a dual hitch system, allowing you to use either a pin hitch or ball system. I have one of our Tech Reps reaching out to you so we can get this taken care of for you. Again, thank you for the review and we are sorry for the oversight. This machine is a monster. Durable, sturdy, efficient, and after a short learning curve, this toe mower gets the job done. I have some tall, two-foot high grass and I use the 5.7-inch height adjustments to knock it down, I can go back a second time at the 4-inch height. The machine was also easy to set and get going. I am glad to have bought this machine, and recommend it to anyone who has a large area to mow. Excellent product. Awesome job, but check out your cotter pins closely before you start using. Also GET the warranty, It will help while you work out the bugs. This thing is a Beast. Love the Beast. We did about 5 acres with no issues after the first belt broke for no reason. We had purchase the start up kit, so we had the extra belt. Warranty was honored right away and new belt is on the way. Love the customer service, pay the extra it is completely worth the price. Full 5 acres and it all looks great! now to hit the forest meadows too. They need to include some extra cotter pins as they are off sized. Acquired this as a replacement to a 33d new holland tractor. I've towed with JD gator and truck through my mango grove. It cuts nice and gets up under low hanging branches so much easier than the tractor did! I'm a fifty year old woman and can manage this with ease. I have had the walk behind model for years with no problems. Fabulous machine! At 72 I'm trying to reduce the walking time as it takes me 52 hrs to do all my fields to clear the grasses the horses won't eat. I do it in small pieces. This machine is so fast, hooked to my ATV. It does a section I would take 3-4 days to complete walking in less than an hour. This is exactly what I wanted to have to clean up each of my 5 pastures as soon as they move to the next to keep the weeds from reseeding. As usual your machines are even better than advertised! This machine is a Beast. It does more than what is supposed to. People walk up to it on the trailer and look with amazement and wonder. The mower works great. The angle bar bent slightly when I backed the unit up. Needs to be heaver. I am afraid that it will bend more. Would be a far better product if controls were via remote rather than hard wired. Would also like to have the mower be able to cut at 12 rather than 7.5 inches. If you have a large area to mow, this is for you! The 52 Tow Behind builds on the durability/capability of the 44 model and increases the cutting capacity and ease of use. Electric actuators allow the deck/cutting height to be raised and lowered remotely without the operator leaving the tow vehicle. The 22hp engine gives the 52 the most cutting power of all the tow behind mowers. The extra 8 of cutting width is a huge time saver for larger areas. I was very impressed with its capabilities during testing. We loved the 52 Field and Brush Mower, it's a beast. It's heavy and powerful. It cuts a huge swath and it will chew up just about anything it goes over. It is a large machine, so if maneuverability is a concern or if you have a lot of trees to mow around, it may not be the best choice. It is great in large open fields that are overgrown with saplings and brush. Perfect for those big jobs! This mower is a great choice for anyone who has an especially large field to mow. With a 52 deck and 22HP engine, it makes quick work of any task. Best of all, you don't need to get off your seat to adjust the cutting height while mowing! Easily raise and lower the deck to go over obstacles such as uneven terrain, logs and rocks. Q.How long will a tank of gas last? A.Thank you for your question. The DR Pro Max-52T has a 2.5-gallon fuel tank. The runtime will vary depending on the vegetation and terrain you're using it on. You will have about a 1.5-2 hour runtime with one take of gas. please feel free to contact us if you have any other questions. Q.Can I tow this using a truck? A.Thank you for your question. We don't recommend towing any of our units behind a truck. This is for safety reasons, both for you and the machine. The DR Pro Max-52T is designed to be towed at a max speed of 5mph, a speed that is not easy to maintain while towing with a truck. You will not have a clear line of sight when using a truck. It would be easy to accidentally run over or hit something. The recommended towing vehicles for this unit would be an ATV or a Lawn Tractor. Please let us know if you have any other questions. A.Thank you for your question. The control cable on the DRPro-Max Field and Brush Mower are designed to be reachable from the seat of a standard Lawn Mower or an ATV. The cord is 14' 5" Please feel free to contact us if you have any other questions. Q.What size ball is needed? A.Thank you for your interest in the DR 52" Pro-MAX Field and Brush Mower. This unit comes with both a pin hitch and a ball hitch attachment. The ball hitch will fit a 2" ball. Please feel free to contact us again if you have any other questions. Q.What gauge steel is the deck? A.Thank you for your question. 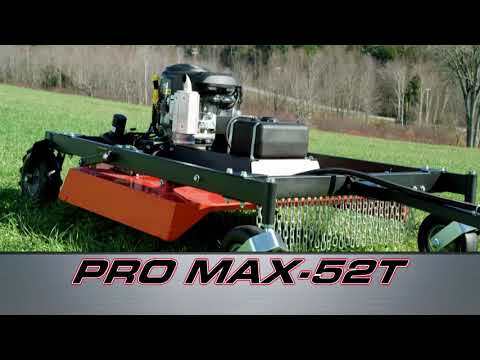 The 52" Pro-Max Field and Brush Mower has a 12 gauge steel deck. Please feel free to contact us if you have any other questions.